The journey of Canadian iron ore from extraction to market is fascinating in its complexity and remarkable investment in infrastructure and commitment. My journey begins at the ArcelorMittal mine in Mont-Wright Quebec located west of Wabush Labrador. Here the ore is mined and concentrated and then transported via a 415 km private rail line to their port at Port-Cartier, Quebec on the north shore of the St. Lawrence River. At Port-Cartier the ore is pelletized or shipped as concentrate to both domestic and international markets. Port-Cartier is particularly notable for its private harbour and fleet of tugboats that skilfully parallel park up to five ships in this compact facility to the constant amazement of seasoned ships' captains and crew. Comprised of an ore dock, grain dock and dry bulk dock, this busy port frequently sees ships unloading one load and transferring to another dock to accept new cargo. At the time of my visit there were an additional six ships at anchor awaiting dockage. From Port Cartier my journey continues via the CWB Marquis - a Canadian domestic lake freighter. Loaded with a cargo of iron ore pellets she travels upbound to Hamilton Ontario situated at the western end of Lake Ontario. Hamilton is home to ArcelorMittal Dofasco - Canada's largest producer of steel. 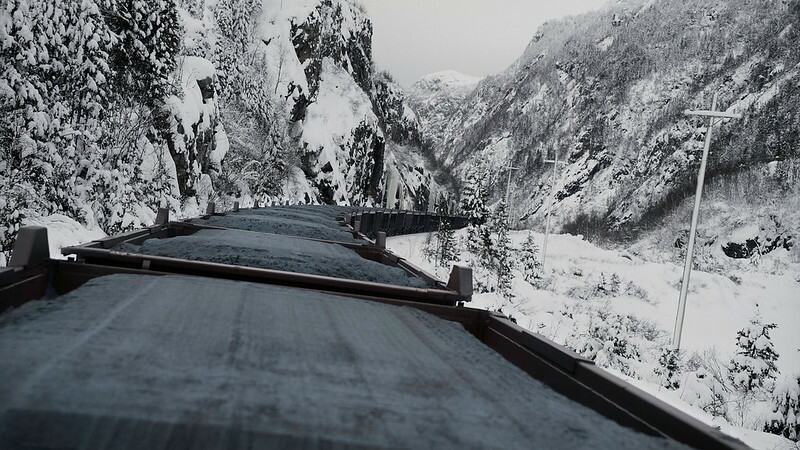 This mile long train runs every five hours, twenty-four hours a day, transporting ore from the concentrator plant at Mont-Wright to their private port at Port-Cartier on the St. Lawrence River.